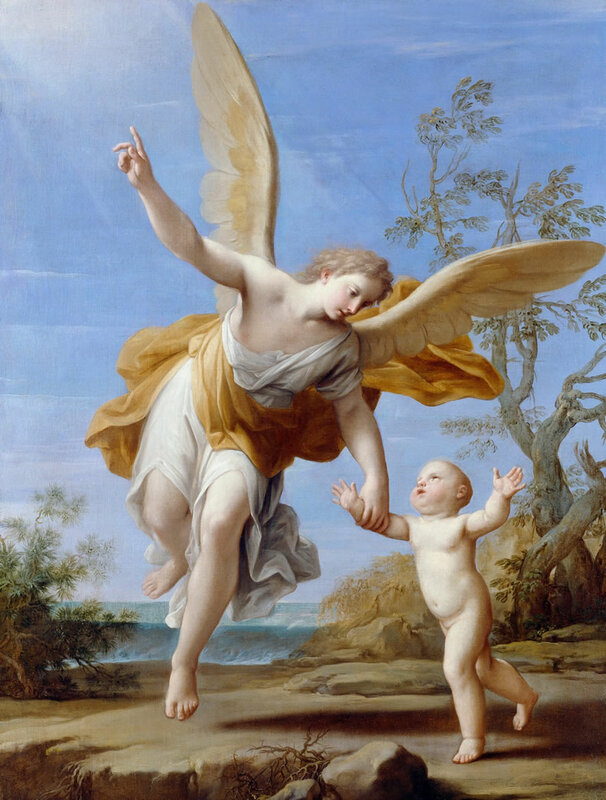 Not much is known about angels, but we can get a pretty good idea of what they are from the writings of theologians, especially Thomas Aquinas who wrote extensively about them, earning him the name the Angelic Doctor. From these theologians, we learn that angels are pure spirits created by God. They don’t have material bodies that can decay so they are immortal once created. They do not need space in which to exist. They are capable of knowing, willing, and loving. Unlike the fallen human nature that needs to toil in order to gain knowledge, angels do not have bodies to gather knowledge. Instead, they were created with infused knowledge about the natural universe. Like humans, they have the free will to choose what to do and love whom they want. In the creation story of Genesis, a fallen angel in the guise of a serpent beguiled Adam and Eve to disobey God. So it would be logical to conclude that the creation of angels (and the fall of the angels) came before the creation of humankind. The Church teaches us that we each have a guardian angel (or angels) when she declares, “From its beginning until death, human life is surrounded by their watchful care and intercession. Beside each believer stands an angel as protector and shepherd leading him to life.” (CCC 336) They assist us in the adoration of God, contemplating Christ and Scripture, configuring ourselves to Christ, and pursuing our role in the building of the Church. Here is where it gets interesting. Since angels don’t reproduce (there are no daddy angels or mommy angels that make baby angels), that means there must be a fixed number of angels when they were created. If each one of us has a guardian angel than it must mean that God created one specifically for each of us. Saint Thomas Aquinas stressed that each angel is a species on its own because they each have very specific characteristics “built in.” This means God tailor-made your guardian angel just for you; your angel is equipped with a nature and the graces needed to keep you safe and assist you based on your peculiarities. Your angel is yours alone. So if your guardian angel was made just for you and existed before the creation of humankind, then it must mean that from that time on your guardian angel waited until the day you were born so it can be with you. It would, seemingly, be rude then if you didn’t get to know your guardian angel and have a relationship with it. We develop a relationship with them by consistently asking them to protect us and pray for us. A relationship is not just one-way communication, so we must discern inspirations devised by our Guardian Angel. As we do this, we will learn how to detect the inspirational nudges of the spirit guardian protectors God gave us. Get to know your guardian angel slowly and surely on your own as it was always meant to be that way – you can’t pay someone who uses cards or a chart to do this (in fact that is superstition.) Get to know your guardian angel. Start today if you haven’t already started.